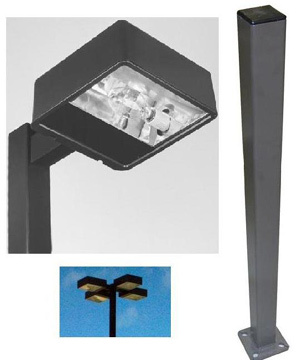 The 25 Foot Square Pole 175 Watt LED Parking Lot Pole Light Kit, Multi-Tap fixtures come with lamps (at 0º tilt) designed to withstand 80 to 100 mph wind zones. The square pole is one piece constructed out of weldable carbon steel with uniform wall thickness. The shaft will yield a minimum strength of 55,000 PSI conforming to ASTMA-500 Grade C. The pole and fixture(s) are finished off with a polyester thermosetting electronically applied powder coat available in Bronze, Black, White, or Green. The fixtures seamless housing is die cast aluminum with rounded corners with a hinged door frame and tempered glass lens that is heat and impact resistant. All seams are welded and silicone sealed for a tight seal to resist the worst of weather. * Please select appropriate options when ordering.